It also directs Zinke to review the locations available for offshore drilling under a five-year plan Obama signed in November. The plan blocked new oil and gas drilling in the Atlantic and Arctic oceans. It also stopped the planned sale of new oil and gas drilling rights in the Chukchi and Beaufort seas north of Alaska, but allowed drilling in Alaska’s Cook Inlet southwest of Anchorage. WASHINGTON (AP) — Working to dismantle his predecessor’s environmental legacy, President Donald Trump signed an executive order on Friday aimed at expanding drilling in the Arctic and opening other federal areas to oil and gas exploration. With one day left to rack up accomplishments before he reaches his 100th day in office, Trump signed an order reversing some of former President Barack Obama’s restrictions and instructing Interior Secretary Ryan Zinke to review a plan that dictates which federal locations are open to offshore drilling. It’s part of Trump’s promise to unleash the nation’s energy reserves in an effort to reduce reliance on foreign oil and to spur jobs, regardless of fierce opposition from environmental activists who say offshore drilling harms whales, walruses and other wildlife and exacerbates global warming. The executive order reverses part of a December effort by Obama to deem the bulk of U.S.-owned waters in the Arctic Ocean and certain areas in the Atlantic as indefinitely off limits to oil and gas leasing. The order also directs Commerce Secretary Wilbur Ross to conduct a review of marine monuments and sanctuaries designated over the last 10 years. Citing his department’s data, Zinke said the Interior Department oversees some 1.7 billion acres on the outer continental shelf, which contains an estimated 90 billion barrels of undiscovered oil and 327 trillion cubic feet of undiscovered natural gas. Under current restrictions, about 94 percent of that outer continental shelf is off-limits to drilling. Zinke, who is also tasked with reviewing other drilling restrictions, acknowledged environmental concerns as “valid,” but he argued that the benefits of drilling outweigh concerns. Environmental activists, meanwhile, railed against the signing, which comes seven years after the devastating 2010 BP oil spill in the Gulf of Mexico. “Scientific consensus is that the vast majority of known fossil fuel reserves – including the oil and gas off U.S. coasts-must remain undeveloped if we are to avoid the worst effects of climate change,” she said. 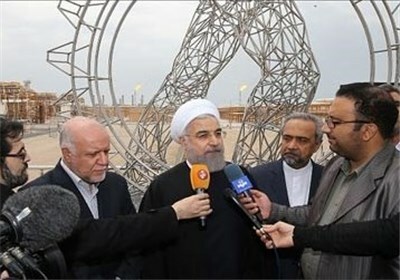 TEHRAN (Tasnim) – Iranian President Hassan Rouhani described the inauguration of the 12th development phase of the massive offshore South Pars gas field as a testimony to the ineffectiveness of the Western sanctions against Iran. “The inauguration of the 12th phase illustrates that sanctions, pressures, and illegal and inhumane measures cannot push the (Iranian) nation back,” President Rouhani said in a Tuesday ceremony in the southern province of Bushehr for the official coming into service of the giant gas field’s 12th phase.The president explained that Iran’s gas production now exceeds 100 million cubic meters, stressing that such a great job has been accomplished while the country has been slapped with the cruel sanctions.Iran has also experienced economic growth and inflation reduction with the sanctions being in place, Rouhani added. According to Oil Minister Bijan Namdar Zanganeh, the 12th phase, which has been totally designed and developed by the local experts, has cost more than $7.5 billion. The 12th phase can produce 80 million cubic meters of gas and 120,000 barrels of gas condensates on a daily basis, bringing the country $17.5 million in revenue every day. Zanganeh has also hailed the new phase as a helpful source of revenue while Iran is hit by “cruel economic sanctions” and the global oil price decline has diminished the country’s financial resources. The 12th phase extends over an area of approximately 205 square kilometers along Iran-Qatar joint border. Located at a distance of 105 kilometers from the coast, the 12th phase alone contains about 5 percent of the whole gas reserves in the South Pars filed. South Pars is part of a wider gas field that is shared with Qatar. The larger field covers an area of 9,700 square kilometers, 3,700 square kilometers of which are in Iran’s territorial waters (South Pars) in the Persian Gulf.